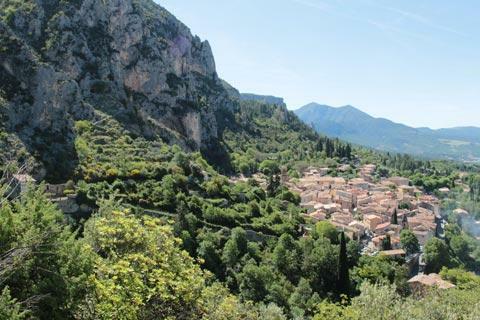 Moustiers-Sainte-Marie is a typically Provencal village dramatically situated below two cliffs in the Natural Regional Park of Verdon and on the western side of the very scenic Gorges du Verdon. 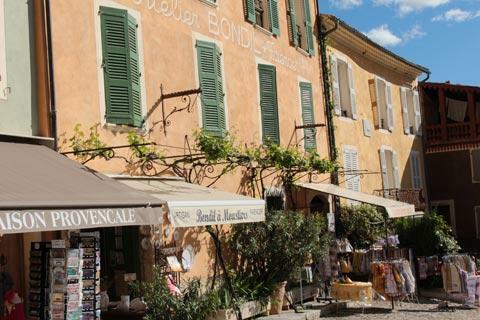 The village is also officially listed as one of the most beautiful villages of France. 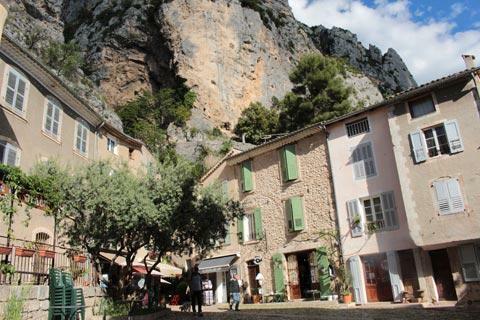 Perched 100 metres up the high limestone cliff, the setting for Moustiers is as attractive as the medieval village itself: everywhere you go in the village you have a backdrop of mountains. 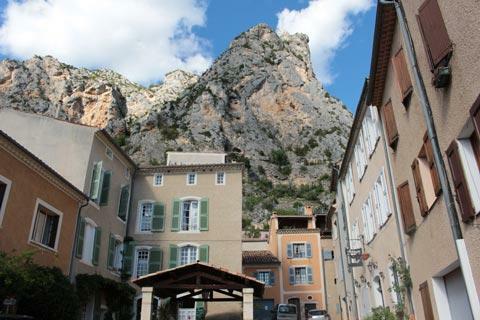 France This Way comment: we are enthusiastic about various villages in France, and we have visited hundreds, but Moustiers-Sainte-Marie is one of our very favourite villages in France and we urge you to visit if possible! 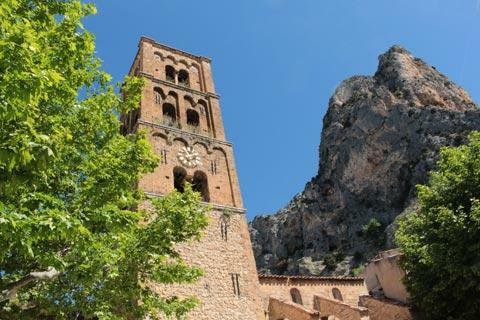 The layout of Moustiers-Sainte-Marie is defined by its geography: a canyon crosses the centre of the village, with the main village centre across the gorge, the historic centre mostly to the left of here, and the path to the famous chapel leading up the gorge. 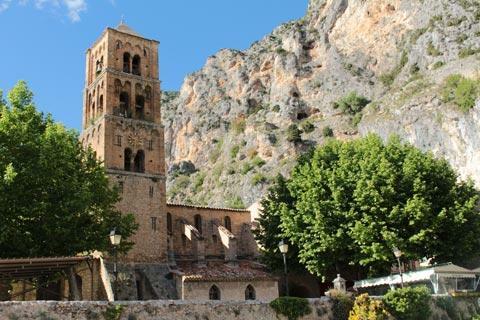 Moustiers is much more lively than many villages, a tribute to its natural beauty and the number of visitors it attracts. 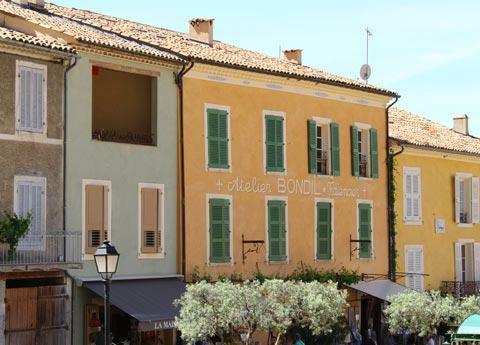 There are numerous shops, cafes and restaurants both in the narrow streets of the historic centre and in the main centre of the village. There is also a great deal to enjoy in terms of historical and scenic interest, with the streets containing numerous attractive houses and babbling fountains. 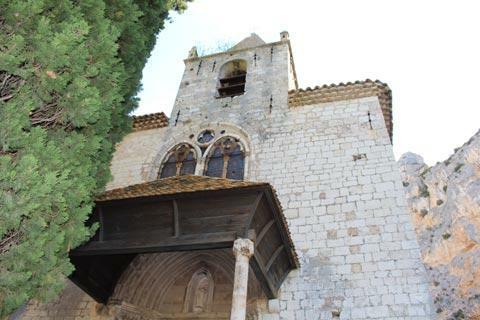 Apart from the general atmosphere you will note particularly the medieval Church of Notre-Dame de l'Assomption with its decorative 'four-storey' square belltower, the most important historical monument in Moustiers. The church was originally built in the 12th century and retains part of its original roman style, although significant modifications were made in the 16th century (hence the gothic style reinforcements on the side of the church). 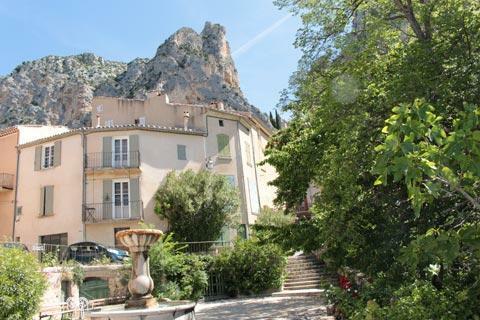 Behind the church is a pretty square with a fountain, the tourist office of Moustiers-Sainte-Marie and a view across the gorge. 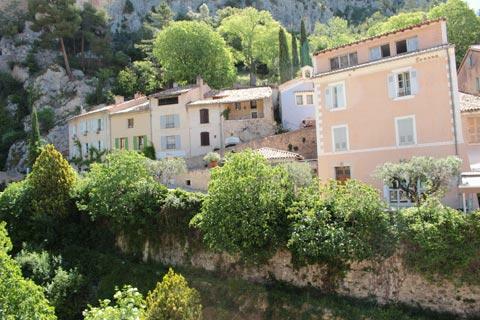 You can also see part of the original defensive ramparts in Moustiers-Sainte-Marie, while a natural scenic highlight is the waterfall in the village centre that results from a stream emerging from the bottom of the cliff. Before tourism became the dominant industry here Moustiers had a long history of making attractive pottery ('fayence'), a tradition that continues to this day and which you will see in some of the numerous workshops in the village. 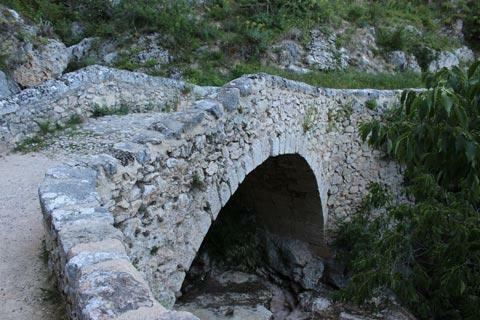 There is also a museum dedicated to the history of the pottery making in the Moustiers. 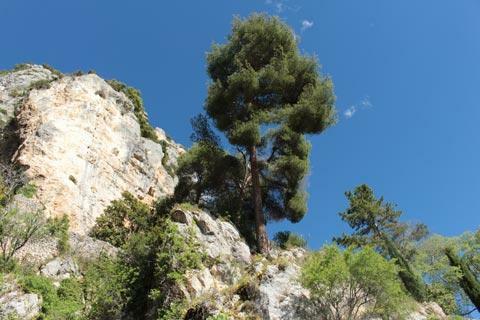 Wherever you are in Moustiers-Sainte-Marie you can see a large shining star suspended above the gap between the two cliffs. There has been a star suspended here for several centuries, although it has been replaced a few times following damage and collapse. The current star is 115 centimetres across. Although the heat might deter you, you really do need to walk up the long flight of steps behind the village to the 12th century Chapel Notre-Dame-de-Beauvoir. 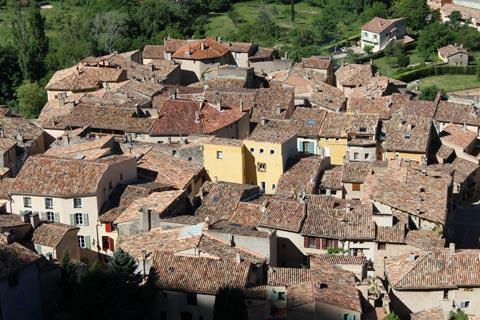 It is not as far or difficult as it looks, and as well as seeing the chapel you also get lovely views across the rooftops of Moustiers. The main path to the chapel leaves the village from the right of the gorge, next to the cemetery and the Chapel of Sainte-Anne*. 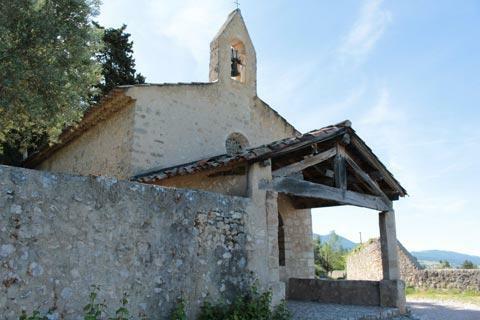 Take a deviation to see the Chapel of Sainte-Anne, mostly to see the far-reaching view across the countryside of the Maire Valley to the Lac de Sainte-Croix and beyond. The Chapel Notre-Dame-de-Beauvoir dates from the 9th century, although the oldest part remaining today, the nave, was built in the 13th century and the rest of the building in the 16th century. Among other highlights see the woodwork of the door and the colourful tiles used on the roof of the porch. The chapel was a very popular pilgrimage centre in middle ages, and in the 17th century was known as a chapel where still-born children would return to life for a few moments, giving them the chance to be baptised and their souls to go to heaven, before being buried in the cemetery. 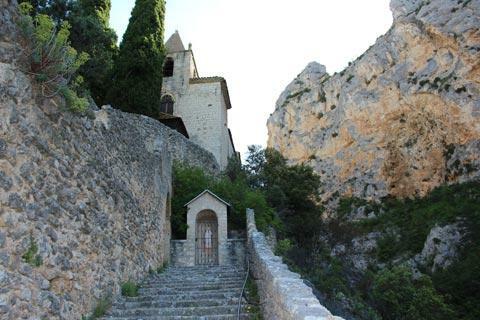 When returning towards Moustiers-Sainte-Marie from the Chapel Notre-Dame-de-Beauvoir we suggest you take the alternative path: turn right about 100 metres after leaving the chapel and take the path that also passes the Grotte Sainte Madeleine. Of course you can also reach the chapel from the village along this path, but the start is not at all clearly signposted in the village centre and the path is much less well maintained than the main path, so we recommend it for the return only. 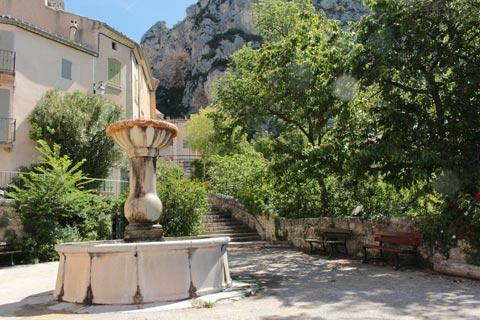 Nobody will visit the region without also exploring the Gorges du Verdon and the Lac de Sainte-Croix: it is these two natural highlights that attract visitors to the region and together with Moustiers-Sainte-Marie make this a very popular travel destination. 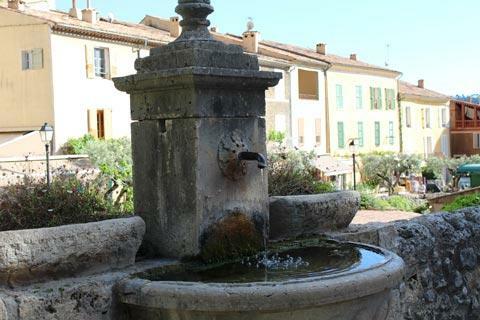 Less well known, the village is also part of the 'Lavender Route' across the Valensole plateau, which is a lovely way to see the famous lavender fields of the region, and some of the less visited towns and villages.